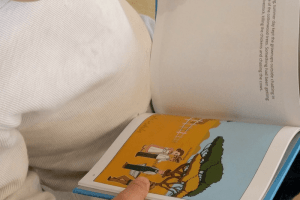 At RootsTech in February, a reader pointed us to a new app for finding family names for the temple. It’s called “Take A Name” by Kinpoint. I tried it out, and it’s pretty great! Within about 15 minutes, the app scanned my tree and found 70 names and 174 ordinances. It also told me how I was related to each person, which I really like. I know many people who want to take their family member’s names to the temple, but are overwhelmed by using FamilySearch to search for people. This app is a great way for the beginner to start. You can find out if there are any names in your family tree that are ready to be reserved. All without even going to the FamilySearch website! Just log in to Take a Name and it starts scanning your tree. Of course, I suggest that everyone who wants to take names to the temple learn how to use FamilySearch, but if you are in a time crunch and need to find a name today, go ahead and try using the Take a Name app. Another important step is to verify that there is a source for the person – a historical record that shows evidence for at least one date and place. It can be as simple as a residence and place given from a tax record, or a census record showing their birth year and place. Also, a marriage record showing the date and place of a person’s marriage is enough to make them unique enough in the FamilySearch system to be enough information for temple work. Yes!!!! This is what I need!! FamilySearch’s website is still so confusing to me because it’s hard to identify what names are ready. It worked wonderfully for me! 77 ordinances the first time. 🙂 Can’t wait to hang on to these for the Tucson temple! It totally worked and confirmed the feeling I have had to do lateral research. Most are like 1st cousins 4 times removed. Or wife of 5th grand uncle. I definately would not have found these names on my own. Okay just checked it out. So awesome! I can do this kind of family history where the names come to me! Trying this out right now, it did actually find 2 names so far! First time finding anything – after 4200 names and counting searched – darn all those genealogists in my family tree – what is left for us to do but try to find the ancients with no records, we will be busy in the millennium. I have the same problem and only got 1 name. My search completed at 11,864 names searched 16 ordinances. Better than nothing which was what I was getting before. My husband found 25 names in 10 minutes from his family. Do you have any of the same problems? I learned from these friends that the “Take a Name” app isn’t just for beginners, but for those who are frustrated because they have such full trees. Many people working on the same pioneer and early Mormon lines make it more difficult to know where to look for missing family members. So many people have mentioned to me that having a full tree is their biggest hurdle with finding a name for the temple. I can understand that. One of my grandparents was a convert, so most of my research focuses on finding his ancestors. The other three of my grandparents come from early LDS ancestors, so it’s more difficult knowing where to start and where to look to find names for the temple. That is why I wrote a book about how to find names for the temple when you have a full tree. 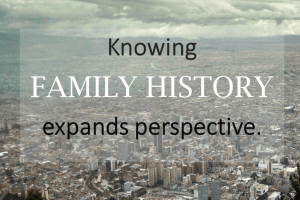 I walk you through the process of finding out when your ancestors joined the LDS church, finding candidates for further research, doing a research project to learn more about them, and then adding what you learned to FamilySearch. Finally, you can reserve names for the temple which you have researched yourself and verified that the information is accurate. 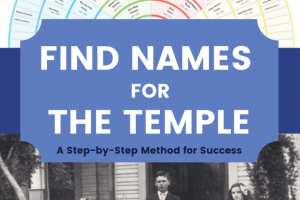 Find Names for the Temple: A Step-by-Step Method for Success by Nicole Dyer and Diana Elder, AG. I was able to help my friend find names for the temple when the Take a Name app found none. We went back in her tree to the convert in England, branched out to his siblings and aunts and uncles, and started tracing their trees. You’ll be amazed by what research has not been done yet, once you start digging in. Do you want to learn about the process I use for finding names? Check out my 6 part blog post series, beginning here: Find Names for the Temple Part 1: Review the Accuracy of Your Tree. Or, to read the process all in one convenient place, purchase my book! Find Names for the Temple: A Step-by-Step Method for Success. What are your biggest challenges in finding a family name for the temple? Comment below! Interesting. I live in Mapleton where a bunch of FS engineers happen to live so we are often their test subjects for various campaigns designed to do this very thing. In the MANY hints they have sent me, I haven’t found a single one that was legitimate. Sure, there was a person in the tree connected to me who was “missing” ordinances, but when I spent a few minutes working, they had a duplicate (or several) and didn’t actually need a single ordinance. It’s left such a bad taste in my mouth for these types of short-cut methods that I avoid them completely. I’ve heard a lot of buzz about this app from the same crowd who have loved the previously mentioned campaigns, but I haven’t even given it a look. Have you spent any time checking to see what percentage of the names suggested through the app actually need ordinances? I would be curious to hear what you think about that. I think each tree is so different that it really depends. My grandpa was a convert so almost all the names that were found were from his side. I recognized many of them as names that my mom or I have worked on. Some were added by others but they are almost all on that side. For someone who has a full tree with all early Mormon ancestors, the names that are found I’ve noticed are further back in the tree and more prone to having duplicates. One of my friends only found two ordinances, but we checked them and there weren’t any duplicates. Her tree was very full, but after doing some analysis, we found the latest convert in her tree and started working on her cousins from that side. She found a lot of people, but she had to add their names first. She was really happy to see that they were from the same side as the name that “take a name” found for her! Not sure! I haven’t followed up with them. I am a firm believer that when people feel a bit of success, they are more likely to come back to it. When they feel a lot of obstacles put in their way, they become discouraged. That’s why I like this app. It gives beginners the feeling of success. ready for ordinances (e.g. a birth year and location) and those missing the qualifying information. Nevertheless, it’s a great app and a great post! Yes, thank you! I will amend the post to reflect this important step of verification! !